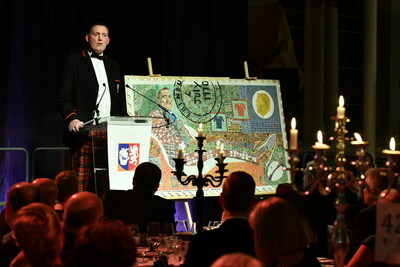 EDINBURGH, Scotland, Feb. 7, 2019 /PRNewswire/ -- On Friday I February Erskine Stewart's Melville Schools (ESMS) welcomed over 700 guests to a glittering charity dinner in the National Museum of Scotland in honour of Stewart's Melville College alumnus, Doddie Weir OBE, to raise money to be shared between by the My Name'5 Doddie Foundation and Access to Excellence. After a very successful evening ESMS are confident that they will be in a position to share at least £90,000 between the two charities with the actual amount to be confirmed as soon as it is available. On the night, guests had the opportunity to bid on a Live Auction, compered by David Henderson, BBC News Presenter and contemporary of Doddie at Stewart's Melville College, and Bryan Lewis, Director of Development at ESMS. The auction was supplemented by several fun charity envelope draws and a pre-event Digital Auction where people had the opportunity to bid on everything from weekends away in the UK to trips overseas, original artwork, a host of rugby memorabilia and opportunities to play golf on great courses. The BBC's Jill Douglas spoke movingly about the vital work of the Foundation but of course the undoubted star of the evening was the amazing Doddie Weir. Doddie delivered an inspiring, humorous and emotional speech where he referenced the fact that he had tried to take the drive he had in rugby and apply this to his own personal battle with Motor Neurone Disease. One of the highlights of the evening was a surprise performance of The Proclaimers' '500 miles', the lyrics completely rewritten as a tribute to Doddie, by soloists, over 100 members of the ESMS senior choirs and most of the audience. A framed copy of the words, inscribed with a personal message by Craig and Charlie from The Proclaimers, was presented to Doddie. "We are very proud to have brought the Erskine Stewart's Melville family together to raise over £90,000 for the My Name'5 Doddie Foundation and Access to Excellence which supports 150 means-tested bursaries to our schools. Doddie's words on the evening were both inspiring and humbling and the standing ovation he received showed how much his old school friends and our wider ESMS family admire his amazing courage and strength of mind."